—Candace Waldron, author of My Daughter He: Transitioning With Our Transgender Children, trans-parent coach, and speaker. 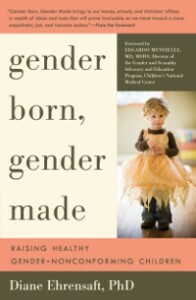 —Edgardo J. Menvielle, MD, MSHS, Associate Professor of Psychiatry and Behavioral Sciences, The George Washington University, Director Gender and Sexuality Development Program, Children’s National Medical Center, Washington, DC and author of the foreword to Gender Born, Gender Made. 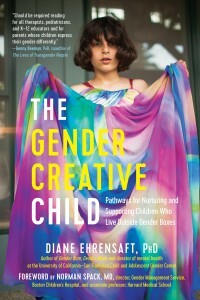 Edited by Toni Vaughn Heineman, D.M.H., & Diane Ehrensaft, Ph.D.
“Diane Ehrensaft has written a rare and brilliant book which will give all of us new insights into ourselves, our children, and the dynamics of marriage and parenting. A lucid, readable, and inspiring book.” –Lillian Rubin, author of Intimate Strangers. “Shared parenting usually means greater involvement by the father in what traditionally is the mother’s domain. What the men and women who chose shared parenting are like, why they have made such a choice, and what effects this choice has on children and on the parents, both individually and as a couple is the subject…In the end, she shows that overall, everyone–children, husband/father, wife/mother, and ultimately society as a whole–benefits from shared parenting.” –John Moryl, Library Journal.